Fully support all iPad/iPhone, latest iPhone XS, iPhone XS Max, iPhone XR, iOS 12, iPad mini 4, iPad Pro and iTunes 12. Ever been terrified of losing your most treasured SMS list that took years to build on your iPhone? Well, worry no more! With this brand new release from 4Media, 4Media iPhone SMS Backup for Mac will help you rest at ease with state-of-the-art software! 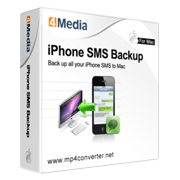 Let 4Media iPhone SMS Backup for Mac organize all your contacts SMS, iMessages for you by backing it up, importing, or saving, your contacts messages to Mac. 4Media iPhone SMS Backup for Mac helps you back up your iPhone SMS and iMessage, including iPod, iPad iMessages to Mac in text or html format. Manage your iPhone SMS, iMessage on your computer screen, enter the name of the contact or directly enter the phone number or even enter the content of the message to fully browse the message you are looking for. Experience complete security and safety, and all the while manage your contacts SMS with supreme ease with an incredibly neat and easy to use interface. Don't hesitate, try 4Media iPhone SMS Backup for Mac for yourself today and experience something new in SMS management! Fast, secure, and reliable transfer iPhone SMS and iMessage to Mac for backup. Besides iPhone SMS backup, this iPhone SMS backup tool can transfer iMessages from idevices to Mac including iPad, iPad 2, iPad 3, iPad 4, iPad mini, iPad mini 2, iPad mini 3, iPad mini 4, iPad Air, iPad Air 2, iPad Pro (12.9/9.7/10.5 inch), iPod, nano (5th Gen), iPod mini, iPod shuffle, iPod classic, iPod touch, iPod touch 4, iPod touch 5, iPod touch 6, iPhone, iPhone 3G/3GS, iPhone 4, iPhone 5/5S/5C/SE, iPhone 6/6 Plus, iPhone 6S/6S Plus, iPhone 7/7 Plus, iPhone 8/8 Plus, iPhone X, iPhone XS, iPhone XS Max, iPhone XR. Back up the SMS, iMessages from more than one iPhone (or other iDevices) at once. With a clear and organized display, never fret about losing a contact or experience trouble trying to find the friend you want to call. 4Media iPhone SMS Backup for Mac will also systematically display all of your contacts information similar to the iPhone contact display.